There has always been a lot of controversy over where the name Beef Wellington actually comes from. One assumes that it came from the 1st Duke of Wellington a great man and the UK´s prime minister in 1828 but some say it was a dish served in Wellington in New Zealand for a civic reception in that era. Either way, it is one of the most wonderful dishes to eat and very easy to prepare and cook. In 2004 I took over at Brocket Hall in Welwyn Garden City near St Albans, London. Brocket Hall was the home of the eccentric Lord Brocket who some will remember for his time on I’m a celebrity get me out of here! Others may remember the burying of his Ferrari collection! Either way, Brocket Hall is steeped in history. Way before Lord Brocket, Lord Melbourne became the UK prime minister in 1835 following on from Robert Peel and the Duke of Wellington and Brocket Hall was his designated home. We still have Melbourne lodge on site at Brocket. I recall that we had Beef Wellington on the menu in 2004 and I referenced it sure that it was a dish created for The Duke of Wellington in or around 1828 at Brocket Hall. Either way it has the elegancy of a Royal dish not least because I have cooked it for various members of The Royal Family who were always delighted with the perfect results. 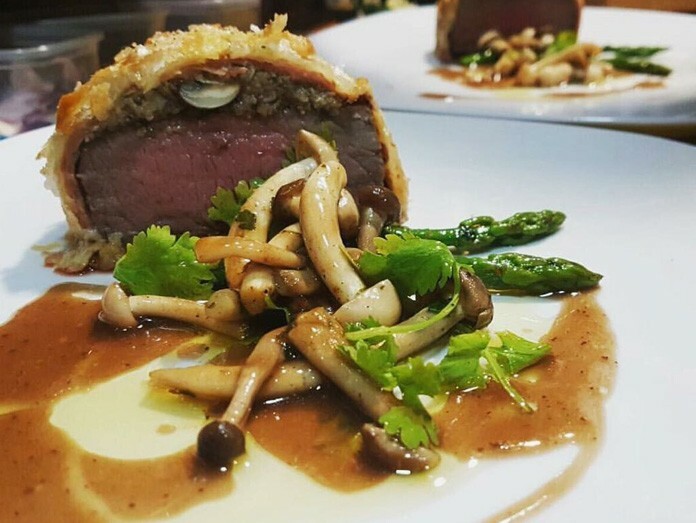 At The Little Geranium in La Cala De Mijas we always have Beef Wellington on our tasting menu. There is only one real Wellington, the one I cooked at Brocket Hall and its here it is for you to try for yourself. Wrap each piece of beef tightly in a triple layer of cling film to set a cylindrical shape, and then chill overnight. Remove the cling film, season the beef then quickly sear the beef fillets in a hot pan with a little olive oil for 30-60 seconds until browned all over but rare/blue. Remove from the pan and leave to cool. Roughly chop the mushrooms and fry in a hot pan with a little olive oil, the onion and garlic and some seasoning. Continue to cook on a high heat for about 5 minutes until all the excess moisture has evaporated. Remove the mushrooms from the pan, leave to cool and then blend in a food processor until fine and then add the cream to bind it together. This is called a duxelle. Check seasoning before using. Cut the pastry into 4 x 20 cm long x 10cm wide and roll out slightly to 2mm thick. Lay a large sheet of cling film on a work surface and place 2 slices of Parma ham on it, overlapping them slightly, to create a square. Place the beeffillets on top of the ham. Spread the mustard evenly on the 4 beef fillets and then the duxelle evenly on top of each piece of the beef. Using the cling film, roll the Parma ham over the beef, then roll and tie the cling film to get a nice, evenly thick cylinder. Repeat this step with the other beef fillets, and then chill for at least 30 minutes. Remove the cling film from the beef and wrap the pastry around each ham-wrapped fillet. Trim the pastry and brush all over with the egg wash. Cover with cling film and chill again for at least 30 minutes or until required. When you are ready to cook the beef wellingtons, score the pastry lightly then bake at 250°C/Gas 7 for 8 minutes until the pastry is golden brown and cooked. Rest for a few minutes before serving. Serve each wellington with a red wine sauce which you should serve separately and garnish simply with fresh asparagus and maybe some baby vegetables.